Move your business forward with unrivaled and innovative conveyor solutions. Revolutionizing the conveyor industry, one link at a time. Your Conveyors are one of the most important pieces of equipment you can have. Without them running properly and efficiently you run the risk of slowing down and jeopardizing the entire production process. Learn the 7 tips to help keep your conveyors up and running for as long as possible. Sorting, merging and accumulating products is a vital part of production, packaging and distribution for many industries. From cosmetic manufacturing to food production, efficient product flow has never been more important. Span Tech’s line of sorting conveyors has been specifically designed to meet these needs. The following are some of the top sorting, merging and accumulation conveyors available from Span Tech. Apace Pak turned to Span Tech when they needed to redesign their facility to prepare for serialization. The EZSpan Conveyor was a perfect solution for transporting product from one area to the next. Whatever your application, our customizable conveyors bring optimum performance to your industry's specific needs. Custom designs. Patented technology. Quick turnaround. Let our systems be the solution for all of your conveyance problems. 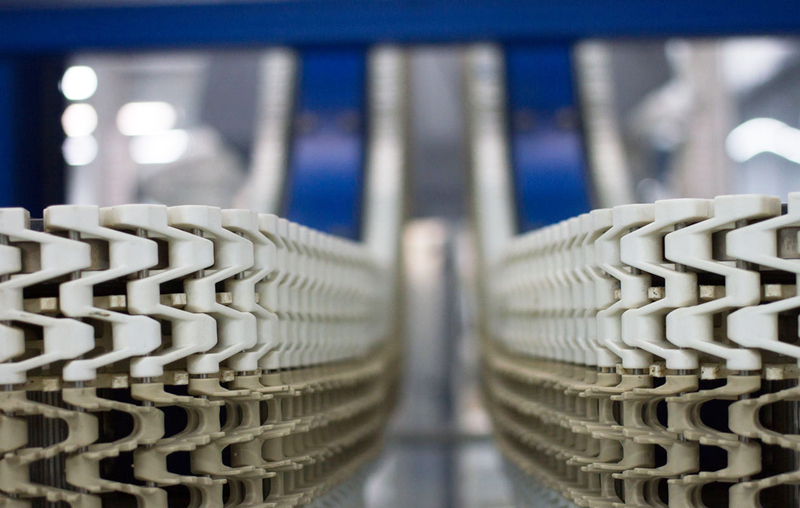 Our twisted conveyors can be used for easy and foolproof product reorientation, or to precisely align items as required for downstream processes. Products can be reoriented by any angle up to a full 90 degrees, depending on the specific need. If a conveyor is twisted along the axis of the side frame, the product will maintain the same elevation. If the twist is along conveyor’s center line, a natural decline of the product will occur. Our factory is unique to the bagel industry because of the various transfer systems we use to boost productivity. It was much more comfortable to work on and increased both productivity and quality since it was easier to inspect the tilted pallets for defects. Want to see more of what our clients said about us?